Our beautiful, custom sign hand crafted by 5 Feet From The Moon has been hung! Eventually, the heart of the wedding (ceremony) will come to a close and you will saunter over, love-struck to the reception. You head straight for the dessert table to sneak a peek at the cake . 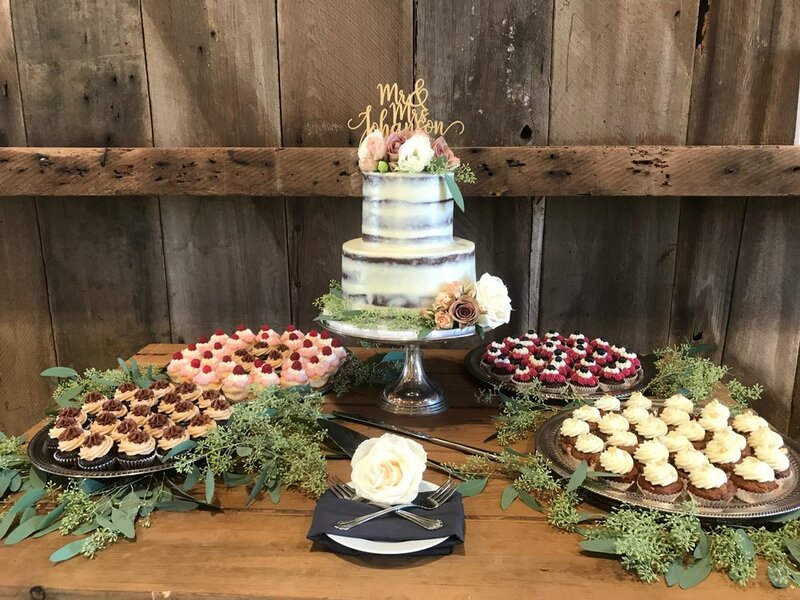 . .
Before you, the couples favorite raspberry rose vanilla cupcakes sit perched above lemon tartlets, while brownies spill off a tiered display surrounded by flowers and, well, I might be getting ahead of myself. Needless to say, unlike twenty years ago, where the most popular dessert option was a white, triple tier cake, with plastic Grecian-style columns, couples now choose a dessert table that is more reflective of who they are. We are excited to share these 4 tips on how to make your dessert display not only taste great, but will inspire your guests to talk about it for years to come. If you're looking for something out of the box, consider using stacked produce crates or an antique table to display your desserts. This couple found an adorable cart for their desserts. Further customize your table with a hand painted sign like their sweet "Adventure Awaits". We recommend considering the backdrop of your dessert display. Your cake and/or dessert display will be photographed and it will be a focal point of your wedding. We find the most photogenic backdrops include natural scenery (plants, greenery), maps, historic buildings, even a nicely painted door or window. Items that are not aesthetically pleasing: light switches, white walls, "club membership" signs (yes, that really happened), etc. If there will be a white wall, consider hanging a non-busy tapestry or a velvet curtain. Keep in mind that mirrors look great in person; however, they are difficult to photograph! Your dessert is the focal point of your reception and flowers and cake go together like love and marriage. Whether or not it's an arrangement or the flowers are integrated in the cake design, flowers will elevate your dessert display. We recommend that you coordinate with your florist to ensure consistency. Often, our couples choose 3 - 4 cupcake flavors for their dessert table, including vegan and gluten free options. Help guests choose the right cupcake by labeling your flavors. For continuity, ask your calligrapher to write your labels! Stay tuned for more wedding and dessert suggestions. Interested in a wedding dessert display? Contact us with button below! And always, Celebrate With Cake!